What Is The Best Metal Detector For Children? 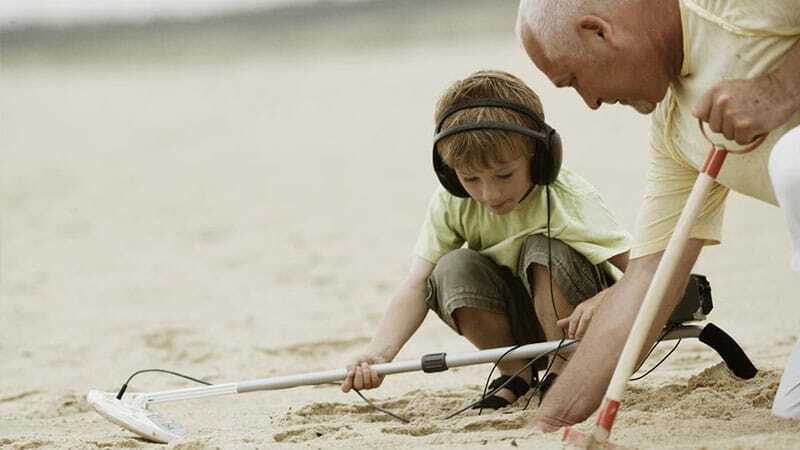 So if you’ve ever done metal detecting around your children, your grandchildren or even just children from friends, they always want to have a go. This is great and I love getting children involved and they really enjoy it, in fact now when I see my grandchildren I hide money around the garden so when they find it they can keep it. Small tip, if you’re going to do that make sure they don’t need to go digging! It won’t leave the garden very nice and your wife might not like it, mine didn’t. Size – This is the most important, depending on how old the children are will mean they need to have a detector that can be adjusted. If they are using one that is too big they will create an angle on the coil and will be detecting in front rather than underneath, which will mean the detector needs a bigger depth and will, of course, cost more money. Weight – Sort of covered in the size of the detector, make sure to get something that isn’t too heavy, it will just make it more troublesome. My back starts to hurt if I’m carrying too much let alone a small child. Simplicity – This is one of the only times I’m not looking for as many gizmos and gadgets as possible, normally I’m trying to get everything possible even though let’s face it, I don’t use most of it! You have to remember what they’re, and that is children. Keep things as simple as they possibly can be. I don’t think many children are worried about which type of metal it is they’re finding, they just want to dig something up out of the ground! Side note: This will also save money! Price – I don’t know about you, but my children and grandchildren haven’t had the longest attention spans, so I didn’t want to go spending a great deal of money on something they would rarely use. Luckily my grandchildren quite enjoy it when it’s nice, it’s something we can do together whilst we’re waiting for food to cook. Even still I wouldn’t want to spend too much on it. With all that in mind the metal detector I would choose time and time again for any child is the bounty hunter metal detector. It really is good value, it does exactly what you need and it costs less than $100. It is the perfect present for any budding metal detector. With the above kit, you also headphones included, you can use any you like, even their own personal headphones. When I first went out I went to parks, beaches anywhere I could to be honest. However taking a child out is rather risky, you don’t want to be digging big holes with them, or rather they don’t want to be. Like I mentioned earlier I found they enjoyed it the most when I planted change around the garden. I hope you enjoy sharing your hobby with them, as always I hope you enjoyed reading my metal detecting blog.